Cassiopeia rises high in the northeast sky, while Ursa Major (the Big Dipper) declines in the northwest. Both these shifts signal the transition from summer to autumn skies. Since Cassiopeia and Ursa Major lie on opposite sides of the North Celestial Pole, there movements center around Polaris-the North Star- throughout the year. The Moon forms a Waning Crescent and appears 16% illuminated, with moonrise at 2:29 AM and moonset at 5:08 PM. The Moon continues as a Waning Crescent and appears 9% illuminated, with moonrise at 3:29 AM and moonset at 5:53 PM. The Moon continues as a Waning Crescent and appears 4% illuminated, with moonrise at 4:30 AM and moonset at 6:33 PM. Just before dawn, the minor Aurigid meteor shower peaks. The meteoroids originate from comet Kiess (C/1911 N1), who’s orbital period measures every 1800 to 2000 years. Minor meteor showers can be difficult to view, but utilizing the advantage of a New Moon will make viewing this shower worth the early morning wake-up. 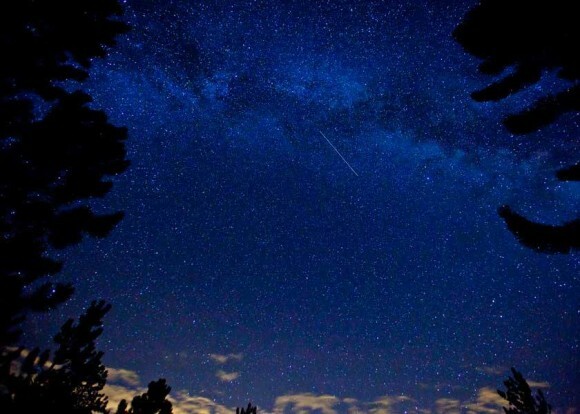 Meteor showers are named after the constellation which they radiate from. Look to the center of Auriga for and occasional appearance of meteors. The Moon continues as a Waning Crescent and only appears 1% illuminated, with moonrise at 5:32 AM and moonset at 7:08 PM. 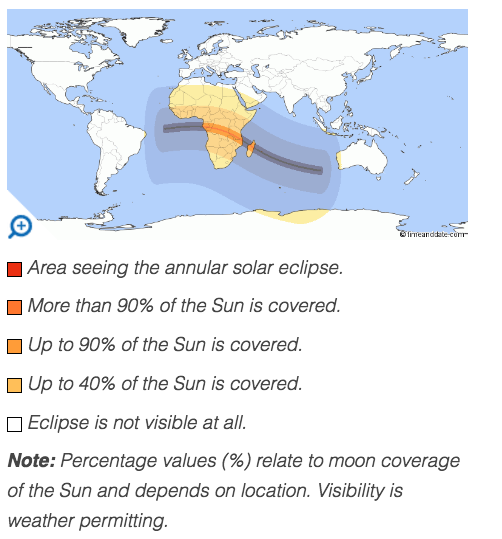 Viewers in Madagascar and Central Africa will witness an annular solar eclipse from Gabon to Mozambique and Madagascar. The maximum eclipse occurs in southern Tanzania, making it the ideal place to observe. Today’s Moon seems invisible as a New Moon. However, the Moon still rises and sets! Moonrise is at 6:33 AM and moonset at 7:41 PM. Neptune reaches opposition, its peak visibility. It will rise at sunset, and ideal observance begins at 10 PM in the southeastern horizon. Neptune still remains elusive, glowing at a magnitude 7.8. Look for the 4th magnitude star Lambda (I) Aquarii, 10˚ southeast of the Water Jar asterism in the constellation Aquarius. From this star Neptune is located merely 1.3˚ southwest. The New Moon continues and only appears 1% illuminated, with moonrise at 7:32 AM and moonset at 8:12 PM. The absence of the Moon from the night sky creates an opportunity to view summer and some autumn constellations with the upmost clarity, especially as the humidity begins to seasonally decrease. The Moon, Venus, and Jupiter form a straight line shortly after sunset, aligned with the Moon at the top, Venus in the middle, and Jupiter at the bottom. The New Moon continues and only appears 2% illuminated, with moonrise at 8:31 AM and moonset at 8:41 PM. *NOTE: All times for moonrise and moonset calculated from our base in New England. Click here to determine local times. Astronomy, Aurigid Meteor Shower, Aurigids, meteor, meteor shower, neptune, Neptune's Opposition, Solar Eclipse, this week's sky. Bookmark.